They say it’s the most wonderful time of the year, but did “they” ever find themselves in charge of the office holiday party? We’re here to ensure that your event leaves employees, clients, or volunteers feeling appreciated, danced-out, and maybe a teeny bit hungover. Our guide covers everything from the most thoughtful time to host and how to set the right tone from the start, while our planning timeline will help you stay on schedule. Get quotes from your largest vendors–venue, catering, bartenders, DJ or photographer. Compare quotes for each and confirm these first. Then you’ll know what you can spend on decor, activities, and gifts. Break out the spreadsheet for this and update it whenever you have a final cost to keep everyone on the same page. Reserve 15% of the budget for wiggle room. Let your guests know the theme with your invitation. Will this be a more formal, jackets-and-ties sort of night, or a kitschy ugly sweater party? Should they come ready to get tipsy, or are you planning a more buttoned-up affair? Our holiday invitation collection has beautiful cards for more traditional end-of-year fêtes, and our new Flyer option allows you to customize your invitation with animated text and images, and send it through your own email provider. Create an invitation that clearly introduces your theme–and be sure to maintain a spirit of inclusivity for all. As soon as you’ve set your date, make it official with a save the date –they’re not just for weddings–or a Paperless Post Flyer. Consider limiting the guestlist to employees. While it can be tempting to have a “the more, the merrier” mentality, keep in mind that including significant others can double your budget, as well as hinder coworkers from getting to know one another on a personal level. Include their loved one to show the company appreciates all they do. Decide on your venue before anything else. It will likely be the most expensive item on your budget, and dictate your activities, decor, menu, and party size. 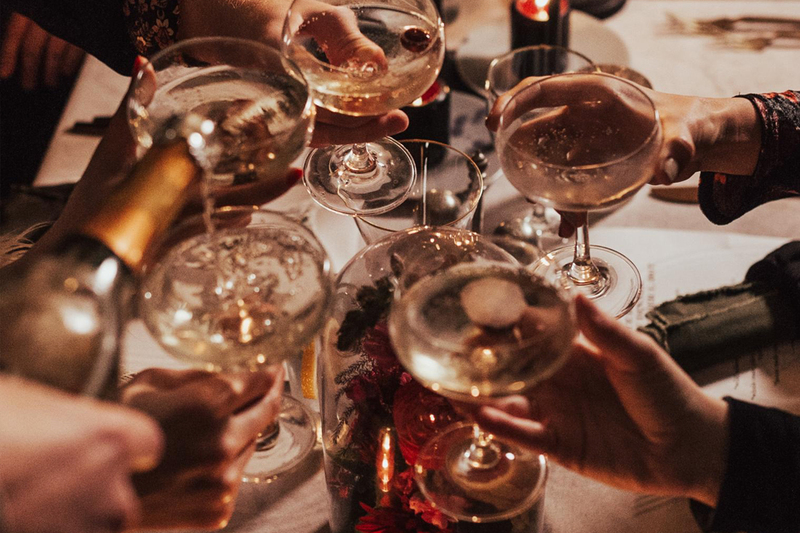 A workplace or bar setting is more appropriate for celebrating employees, an upscale dinner makes clients feel extra special, and an event space with room for speeches is better for reflecting company culture. For a more unique space, rent an apartment or loft from Peerspace, Appear Here, AirBnB, or The Venue Report. Set the date as soon as you can. Employees are probably already juggling a busy end-of-year social schedule, so the earlier they can put yours in their calendar, the easier their December will be. The first or second week in December is best, ideally on a Thursday or Friday. Be thoughtful about the time of day. An event that starts at 4pm may be more convenient for commuters—a good rule of thumb is to start your party an hour before business closes for the day. Set the scene for employees to get to know each other out of the office. Just because you’re throwing a professional event, doesn’t mean it can’t feel fresh and fun. Atmosphere: The good news is you don’t need to book Drake. A successful party needs three things: people, ice, and music. If you have it in your budget to hire a DJ, go for it. If not, get guests in the spirit by polling the office for favorite tunes. Take a look at ours to get started. People rarely tire of a photo booth—give yours a Yuletide spin with an Ugly Sweater mug shot station. For a more affordable option, a portable photo printer or scattering Instax cameras on the tables let your guests play photographer all night–which people tend to love as much as they loath playing bartender. Food: Heavy appetizers are the sweet spot to keep people happily sipping while not breaking up the celebratory flow with a sit-down meal or long buffet line. Friendly reminders: guests should be able to eat an appetizer with one hand, and don’t ask them to help prepare or pay for the meal. After all, you’re celebrating them! Drinks: If you are serving alcohol (which we recommend), hire a bartender. The last thing you want to do is task an employee, or yourself, with mixing drinks all night. Consider asking your bartender to throw together a signature cocktail and name it after a company-wide joke or office mascot. Be aware of drinking safety; you want people to have fun, without regrets. Decor & Decorum: No need to go overboard here, a hint of tinsel or greenery goes a long way. Rather than doing a lit bit of everything add one thoughtful decor moment and call it a day. Adorning cocktail napkins or cups with a festive design is a nice touch and easy to do with sites like For Your Party. Last but certainly not least, make sure you (or the appropriate person to do so) takes a moment to thank everyone for a year of hard work. You have a plan, now you need an invitation. Consider our Flyer option for a more customizable invitation that’s easy to share even without guest emails. Paperless Post invitations and Flyers remind guests the party is almost here!